Change things up with these side-trips from Jeju: Seogwipo (Gwangchigi Beach & Seongsan Ilchulbong). 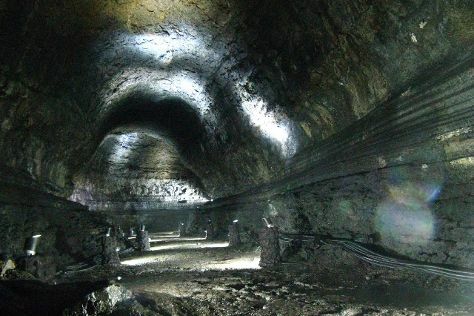 And it doesn't end there: explore the fascinating underground world of Manjanggul Cave, kick back and relax at Hyeopjae Beach, make a trip to Mysterious Road (Dokkaebi Road), and step off the mainland to explore Udo. To see maps and tourist information, you can read our Jeju trip planner . Singapore, Singapore to Jeju is an approximately 10.5-hour flight. You can also do a combination of flight, taxi, and ferry. The time zone difference when traveling from Singapore to Jeju is 1 hour. When traveling from Singapore in October, plan for colder days in Jeju, with highs around 24°C, while nights are little chillier with lows around 23°C. Cap off your sightseeing on the 1st (Thu) early enough to travel to Busan. 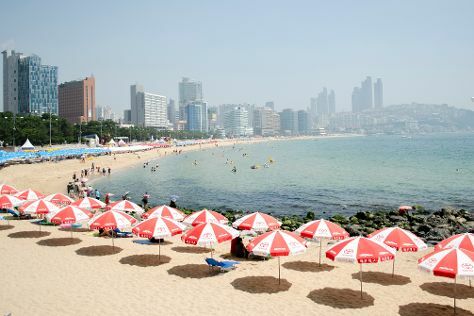 Busan is known for beaches, historic sites, shopping, parks, and spas. Your plan includes some of its best attractions: kick back and relax at Haeundae Beach, wander the streets of Gamcheon Culture Village, contemplate in the serene atmosphere at Haedong Yonggung Temple, and stroll through Yongdusan Park. Plan a Busan trip in moments using our itinerary builder. You can fly from Jeju to Busan in 3 hours. Alternatively, you can do a combination of ferry and car; or do a combination of ferry and bus. In November in Busan, expect temperatures between 18°C during the day and 6°C at night. Finish up your sightseeing early on the 5th (Mon) so you can go by car to Gyeongju. Start off your visit on the 5th (Mon): contemplate the long history of Donggung Palace & Wolji Pond, appreciate the extensive heritage of Tongiljeon, then contemplate the long history of Bulguksa Temple, and finally appreciate the history behind Seokguram. To see ratings, maps, traveler tips, and other tourist information, go to the Gyeongju trip planning website . Traveling by car from Busan to Gyeongju takes 1.5 hours. Alternatively, you can do a combination of subway and bus; or take a train. While traveling from Busan, expect little chillier days and about the same nights in Gyeongju, ranging from highs of 10°C to lows of 8°C. On the 6th (Tue), wrap the sightseeing up by early afternoon so you can drive to Sokcho. Kick off your visit on the 7th (Wed): explore the striking landscape of Seoraksan National Park. Get ready for a full day of sightseeing on the 8th (Thu): take in the spiritual surroundings of Naksansa Temple and then trek along Ulsanbawi Rock. To see reviews, traveler tips, more things to do, and more tourist information, read our Sokcho trip website . Traveling by car from Gyeongju to Sokcho takes 4 hours. Alternatively, you can do a combination of train and bus; or do a combination of train, taxi, flight, and bus. Wrap up your sightseeing on the 8th (Thu) to allow time to drive to Chuncheon. The capital of the country's northernmost province, the city of Chuncheon acts a gateway to the wilder sights of the rural region. 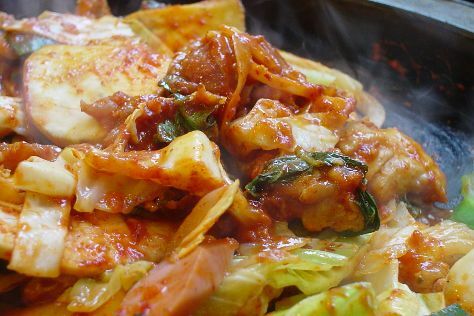 Kick off your visit on the 9th (Fri): take a stroll through Chuncheon Myeongdong Dakgalbi Street, take a stroll through Chuncheon Myeongdong Street, and then step off the mainland to explore Nami Island. To see traveler tips, photos, and tourist information, you can read our Chuncheon road trip planner. Traveling by car from Sokcho to Chuncheon takes 2 hours. Alternatively, you can take a bus. November in Chuncheon sees daily highs of 13°C and lows of 3°C at night. Cap off your sightseeing on the 9th (Fri) early enough to go by car to Seongnam. Kick off your visit on the 10th (Sat): pause for some photo ops at Statue of Peace and then make a trip to Seongnam Arts Center. For more things to do, traveler tips, ratings, and tourist information, go to the Seongnam trip planner . Traveling by car from Chuncheon to Seongnam takes 1.5 hours. Alternatively, you can do a combination of bus and subway; or take a subway. November in Seongnam sees daily highs of 13°C and lows of 3°C at night. Wrap up your sightseeing by early afternoon on the 10th (Sat) to allow enough time to drive to Seoul. Seoul is known for historic sites, shopping, museums, parks, and nightlife. Your plan includes some of its best attractions: step into the grandiose world of Gyeongbokgung Palace, take a stroll through Insadong, brush up on your military savvy at The War Memorial of Korea, and get to know the fascinating history of Cheonggyecheon Stream. For maps, where to stay, and other tourist information, refer to the Seoul trip planner . Seoul is just a stone's throw from Seongnam. In November, plan for daily highs up to 13°C, and evening lows to 3°C. Wrap up your sightseeing by early afternoon on the 14th (Wed) to allow time for travel back home.